The Savoir bespoke service starts when fitting the client for the bed, like a Savile Row suit the bed set will be tailored to provide the correct level of support and a comfortable feel. 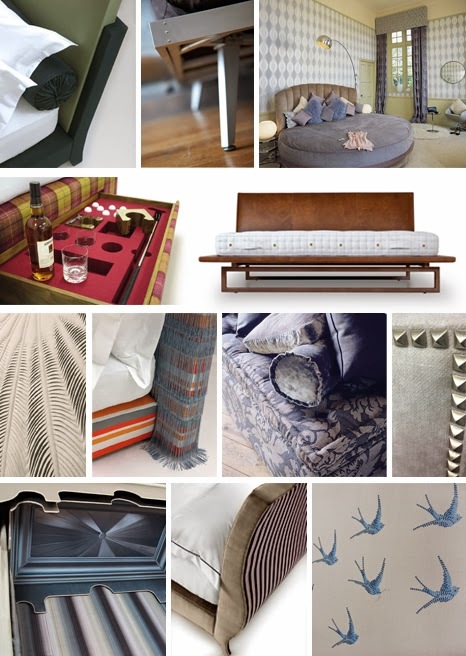 When it comes to defining the style anything is possible, beds and headboards have been made to all shapes and sizes to fit clients requests, as well as infinite choice of fabrics and finishes. Also little details like a secret drawer for your jewellery or even a personalised nameplate, complete with your wedding date, it can all be done. A huge £18,000 circular bed, upholstered entirely in suede, for a spectacular 1970’s style hotel suite at Stapleford Park, set in some of England’s most stunning grounds. The room, known as the Savoir Suite, owes much to Austin Powers with shag pile, circular mirrors and glitter balls. 24 beds for the late King Hassan of Morocco. The King normally took his own bed on his travels, but during one visit to London his staff discovered that the bed had been ruined, and he had to make do with the bed in Claridge’s, where he was staying. It was, of course, a Savoir Bed and he slept ‘as though on a cloud’ and promptly ordered 24 for his palace. Savoir made a mattress to fit an extra long bed frame originally commission for Mussolini. Savoir have made beds for three James Bond actors. A 108” wide bed for a couple with 5 kids who like to join them in the night! Many odd shaped beds for yachts – owners are coming round to the view that the standard foam mattress in a yacht costing many millions of dollars simply does not make sense. Savior Beds are truly bespoke and thanks to a talented team of designers and craftsman no two Savoir beds are the same. We embrace the challenge of creating something entirely original every time. View our online gallery for more examples. Fantastic - I love it! !